Solar power from Africa's deserts could supply all 600 million citizens currently without electricity and even export power to Europe, a green energy conference in Nairobi heard Thursday. 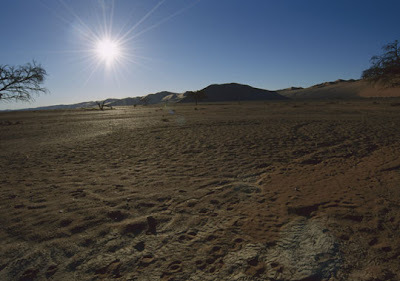 The ferocious desert sun could provide the energy equivalent of 1.5 barrels of oil per square kilometer, said Gerhard Knies, project manager for Trans-Mediterranean Renewable Energy Cooperation (TREC), at a meeting of nine African states. "The largest source of energy is the solar radiation (and) the best place to receive solar radiation is the desert," he told reporters at the start of meeting of 20 parliamentarians in Kenya. "Deserts get 700 times more energy per year than all human kind is using," he explained. "It is as if a layer of 25 centimeters (10 inches) of oil is falling down in the deserts year after year." The legislators from Burundi, Djibouti, Ethiopia, Kenya, Madagascar, Rwanda Tanzania, Uganda and the Seychelles are at the conference to discuss energy access for the poor. "There is great need to provide the poorest people in east Africa with electricity," said Nicholas Dunlop, founder of the "e-parliament" conference. "But at the same time there is an urgent need to combat climate change." Dunlop explained that the technology needed to provide solar thermal energy was simple and clean compared to extracting and processing fossil fuels. "A combination of mirrors and pipes to concentrate the sun's heat to boil water and drive an old fashion steam turbine." "One you have built your mirrors and pipes ... your costs are finished. The good Lord does the rest," he said. He added that solar energy costs were steadily coming down as the industry expanded, notably in Europe, while "oil is famously going through the roof." "Now renewable energy is considered as a supplement to fossil fuels. We have to look at fossil fuels as supplements for renewable (energy)," said Knies. Stephen Karekezi of the Environment and Development Network for Africa said high oil prices were fueling the drive for alternative and cleaner energy sources. "We are quite excited by this opportunity... that the high oil prices begin to turn our policy makers to actually contribute and push for renewable (energy)."